This title is a lot like "How I Spent My Summer Vacation," but I hope I can express here what I love about this community. I haven't been beading for very long (and seem to be a slow learner about lots of it) but I have made some remarkable friendships along this journey. It is amazing to me how kind and helpful and encouraging you all are. I read blog after blog after blog because I just really like knowing you all and how you express your creativity along w/ the doubts and fears and love and joy it brings you. I want that, too. I just made a bracelet this weekend for a neighbor who has been particularly great to my husband and me (and one for her mom, too). 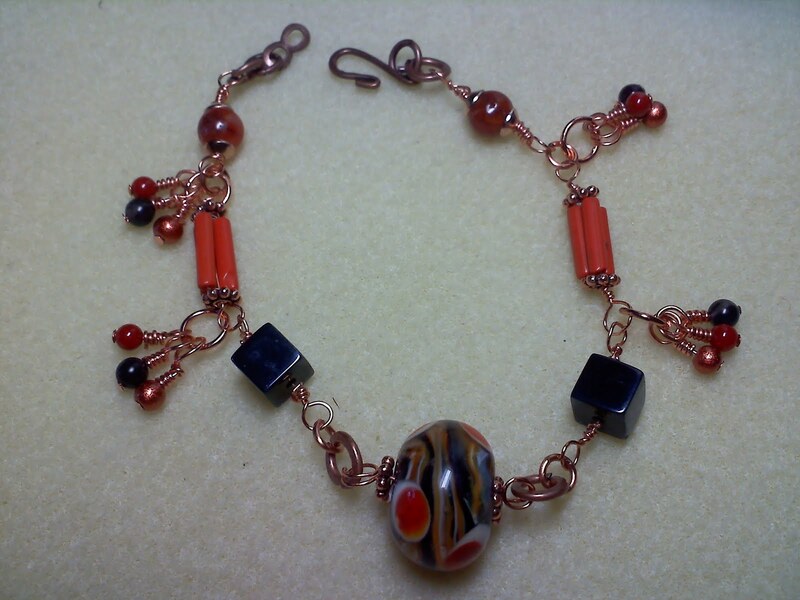 (This has some onyx, a lovely focal from Lauren at Redredmelt on Etsy, some coral, and sardonyx.) She called and was so profuse with her thanks that I was embarrassed and kept telling her that I don't know what I'm doing yet, that I'm still learning, th at this bracelet isn't so great!! Wouldn't it have been so much better to just shut up and say thank you. Yes, it would! So clearly I'm learning another lesson while learning to be a beader/jewelry maker. And that secondary lesson is a much harder one for me. I loved making this and making it for a particular person made it more enjoyable for me. I tried to think about her colors and the colors she wears and hoped to find something to blend. The one I made for her mom was much much different. First of all, her mom wear s softer colors and more yellowy, greeny things. So this is what I came up with for her. [This photo makes it look like the jump rings are all scratched and marred but they aren't.] 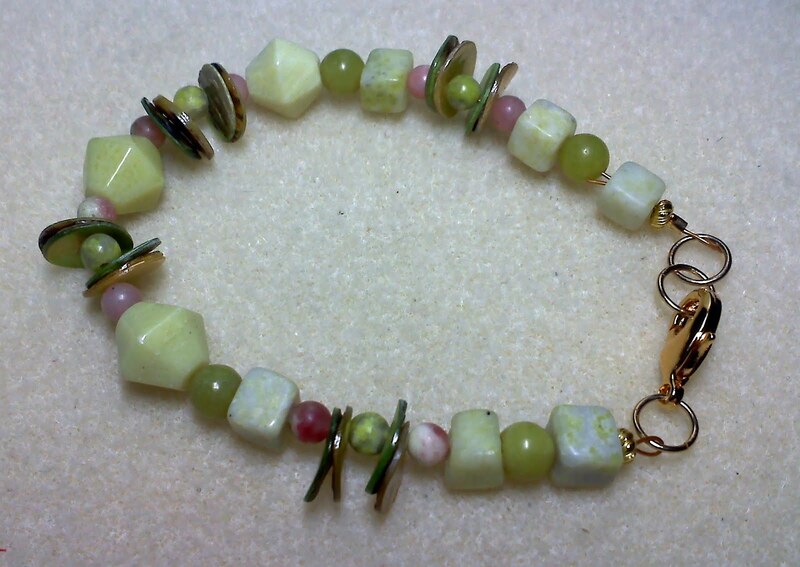 There are 2 kinds of jade, some pink lepidolite and those flat shells are in green & yellow. Because the backs of the shells are not so pretty, I used two each time back-to-back. I was wondering if I should have glued them together but decided not to (well, not exactly decided -- I didn't have any glue!). 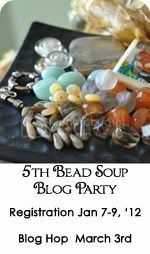 So why I started beading is to learn something new, to play with all you bead bloggers, to get immersed in color again (quilting and knitting came before beading). And what I'm learning is a lot about beading and a lot more about myself and some life lessons I need to learn. Seems like a win-win situation for me. Isn't that grand? I instantly connected with your blog - just reading it made me feel like I know you....and think that's 'cause we're a lot alike! I am now following you and put you in my daily blog feed - looking forward to reading more! Great job on the bracelets Sally, don't be so hard on yourself (lesson that was hard for me as well). We creative folk tend to pick at the little mistakes (which everyone says gives your piece character) that no one else sees. Keep on going and before you know it you'll be amazed at how much your skills have improved from that first piece you made. You are so right Sally! I love your bracelets! Hi Sally, both of your bracelets are beautiful & thanks for sharing the story behind them and how you started beading! So glad you took the plunge and started blogging. You'll find it's a fascinating journey! Awesome blOG Sally - congrats! Sally, I had posted a comment a few days ago on your first posts but I know they are lost in blogosphere. :-) I wanted to tell you that I'm glad you started beading and now blogging! What pretty bracelets for your neighbor and her Mom. I know they must have been well-received!